During the dawn of the American space program astronauts didn't have it easy. Sometimes they called themselves "spam in the can," referring to the tight quarters inside the early capsules and also the lack of control they had over the vehicles. This was way before the days of the space shuttle. Instead of gliding to a landing like a plane after a mission, the astronauts just fell into the ocean, the fall slowed down by parachutes. A whole Navy fleet would search for the floating capsule and then it would be fished out. Predicting where the capsule would land wasn't an exact science with the early missions. 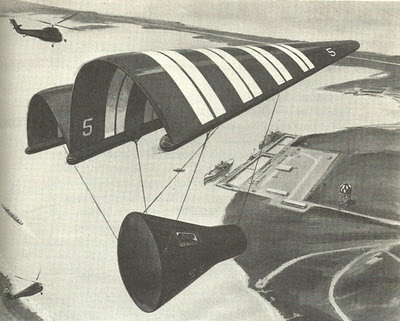 Until I picked up an old book the other day, I didn't know that there was a plan to return the Gemini astronauts hang-glider style. Flipping through the slightly musty pages of America's Race For The Moon: The New York Times Story of Project Apollo (1962) I spotted an illustration for a proposed capsule design that would allow it to return home on land. Apparently NASA was hoping to use a paragliding parachute so that the capsule could glide through the sky, landing on a dry lake bed like the shuttle would years later. Skids would be added so that the ungainly-shaped capsule could land in proper fashion. Doing some online research I found a YouTube video that explained that dummy models were tried out but the design was too challenging, there wasn't enough time to perfect it. Caught up in the space race -- "Gotta beat those damn Commies to the moon!" -- the project was soon abandoned. So it can be truthfully said that a Gemini astronaut never left skid marks on a bed. 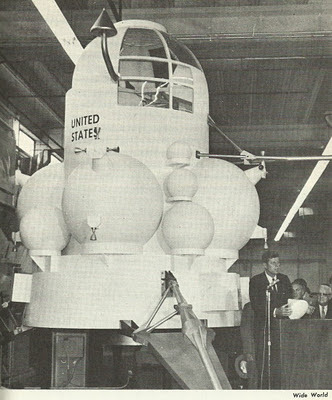 And within the pages of the same book I spotted a photo of President John F. Kennedy giving a speech in front of an early mock-up for a lunar excursion vehicle. To me that LEM looks like a Martian tool shed from a 1950s EC comic book. With the end of the space shuttle program -- it didn't save money as promised with its re-usable orbiter -- NASA is returning to the capsule design, this time with a bit more elbow room for the spam aboard. On April 16, 2008 – a day that will live in infamy – Pope Benedict declared military victory over the United States of America. Or so says Tom Friess, host of the program Inquisition Update heard on domestic shortwave radio station WWCR. I was dialing around when I encountered his program. Tom warned that millions of Catholics were ready to obey any command from the Pope, a fifth column within our midst. I’m an ex-Catholic. Fortunately, I was never molested by a priest or a nun. But when I was an impressionable boy, the Roman Cultic Church did lay on the fear and guilt. In one catechism class a nun told us that when nuclear war erupted, an atomic bomb would open up a pit into hell. And unless we young sheep confessed our sins, we would fall into that pit, burning for eternity. A burn from a hot stove, she explained in vivid detail, was nothing like the ever-frying flames of hell. And people wonder why I’m a devout atheist. So while I have no great love for the RCC, I don’t buy into anyone out there who equates the Pope with the Anti-Christ or the Whore of Babylon. It’s the same Mega-Conspiracy scam: take some unpleasant facts about a particular group or organization – CIA, FBI, US Army, the Vatican, whatever – and use them as proof of a great plot to enslave the world. What appear to be just a few bad deeds by certain individuals is more than that. Those deeds are really evidence of a vast conspiracy lurking in the shadows. 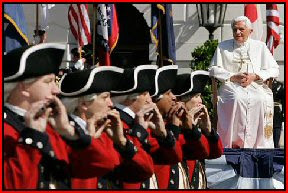 According to Friess’s Website, http://inquisitionupdate.org/, President Bush held a special ceremony on the south lawn of the White House during the Pope’s visit to the US back in 2008. Friess claims that all sorts of symbolism – apparent to those fifth columnist Catholics – during the ceremony reveals the truth. He also notes the Knights of Columbus – the RC answer to the Freemasons – was standing side by side with the US Army. Ergo, the KoC and the Army are equals under the Pope. This is what I call hyperlogic. If I happen to be standing next to a pregnant woman when a photo is taken, then that proves I’m the father of her child. Anyway, since the Pope is now the Big Cheese, what has he done lately? Is he plotting action against the Israeli Lobby? Will “knighted” assassins wearing funny caped suits and plumed hats eliminate all threats to the Vatican? And instead of worrying about women using burqas to conceal weapons, should we be careful around uniformed nuns? 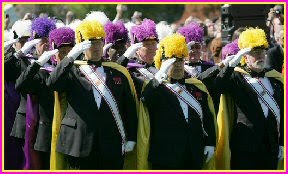 Rapturous welcome and 21-gun birthday salute for Pope in the U.S.
Psychic Children: Reality Or Just Reality TV? I’m a 360 skeptic: I’m skeptical about everything, including professional skeptics. So I don’t rule out the possibility that on rare occasions a few people might experience some sort of psychic phenomena. Recently I watched a documentary series that purported to show actual psychic kids dealing with their powers. While I’m never had any special metaphysical powers, I can understand how these kids feel like outsiders due to the talents they have – or think they have. The problem with “reality” TV is that it has to be entertaining. Sometimes the psychic kids series went over the line for me, using special editing techniques like quick cuts to heighten the suspense. And if the producers could goose certain scenes through such effects, what else did they goose? I’m not saying the producers were deceptive but I’ve heard about others whose psychic talents were wanting at times: they couldn’t consistently produce the startling results and so sometimes they cheated. As I watched the series, I wondered what was edited out. After all, who says the producer didn’t leave on the cutting room floor any scenes of mistakes, failures to perform? Sorry, but I need a more objective documentary that isn’t concerned with pumping the ratings. Infotainment doesn’t cut it for me. Especially “reality” TV.